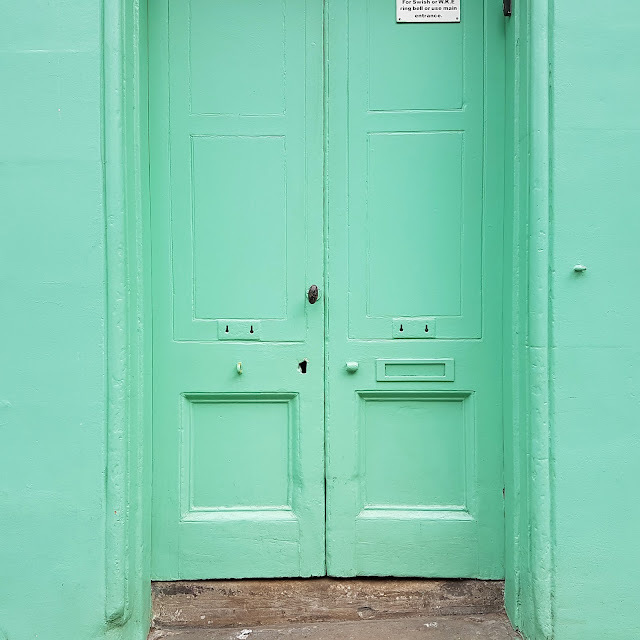 This is the first of 21 travel posts - you've been warned :) Packing as much as we can into our last 11 months living in Germany!!! I'll have some scrappy posts scattered throughout so don't run away too fast! 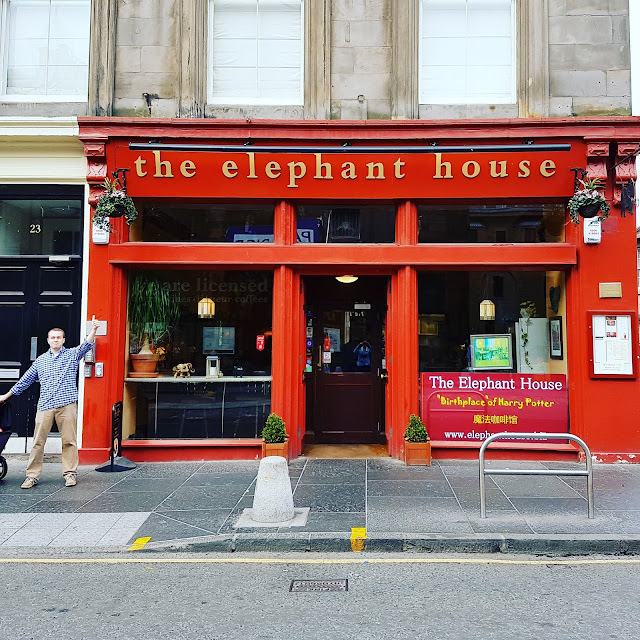 We had actually planned our trip to Edinburgh back in June, purchased the flights, hotel, day trips, the whole enchilada. Then a few hours before our plane was supposed to take off, we changed our minds. It just didn't feel right, I can't really explain. Bad feelings are bad feelings and we listened to our guts. But then we had a free 4-day weekend so we re-booked and off we went! 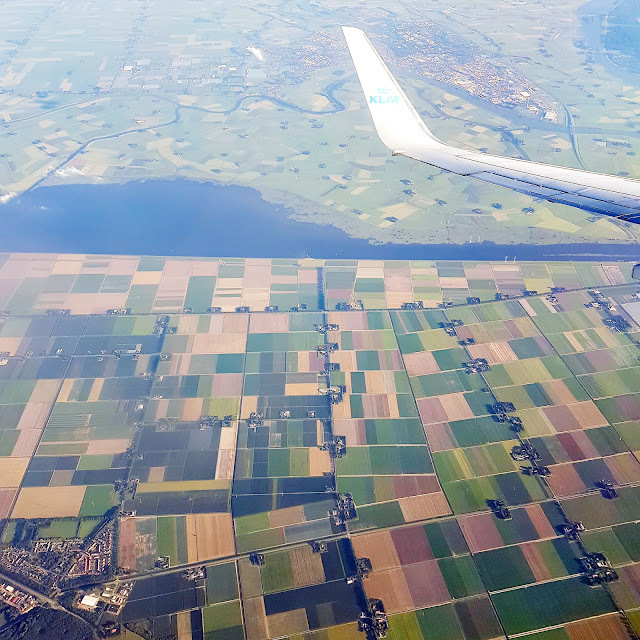 We had a layover in good ol' Amsterdam. Can you spy all the canals? My dad's favorite brand of chocolate is Holland-based Drostes so I've been on the hunt for it for months with no luck. 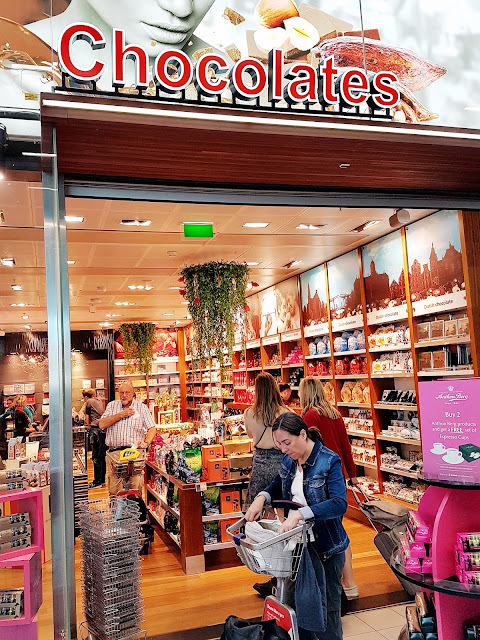 Finally, when back in the Netherlands, at the airport, we found some! We arrived very very late in the evening to a pair of super nice and friendly airbnb hostesses then quickly settled in and went to sleep, anxious and ready to explore Edinburgh the next morning! At first glance Edinburgh very much reminds me of Dublin what with all the pubs and flowers! 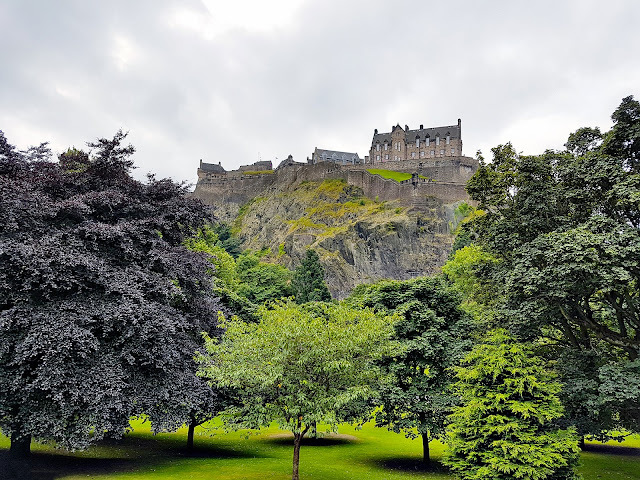 We walked straight to Edinburgh Castle, set high up on the hill. 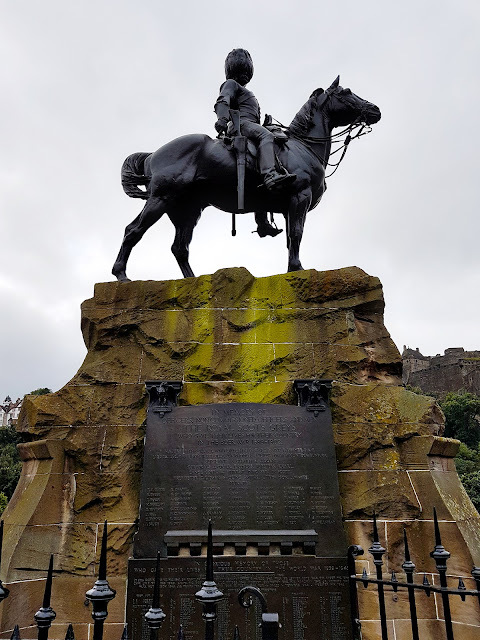 Equestrian monument to the fallen soldiers of the Royal Scots Greys. When I said we walked "straight" to the castle, I meant we got off the bus from our apartment at the stop closest to the castle, which still left us with a windy, steep up-hill trek to the castle and the start of the famous Royal Mile. Up we trudged! Those views tho! Pretty. It just feels like the UK knowwhatimean? 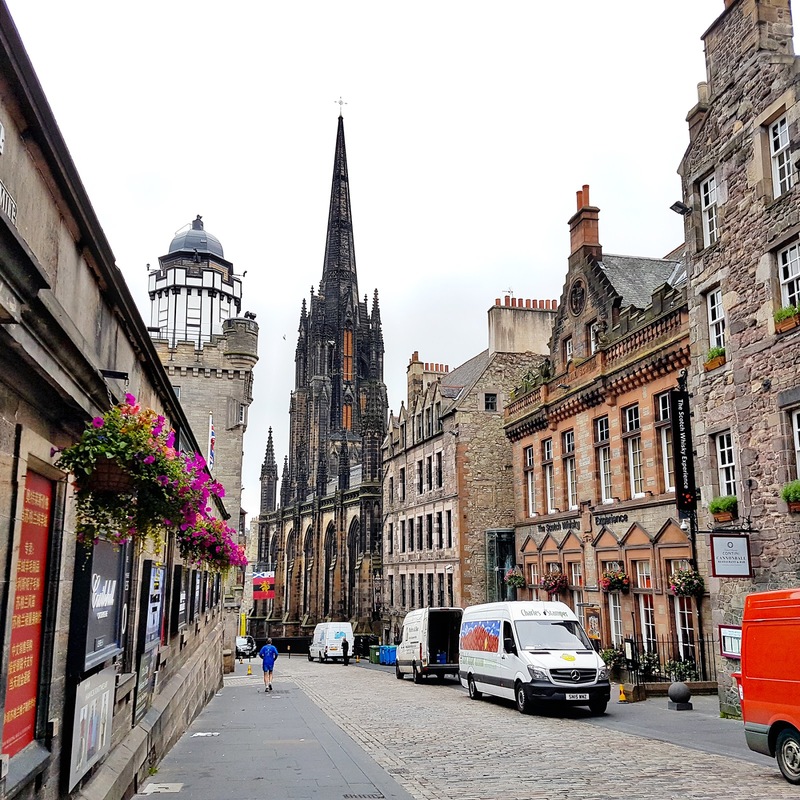 The Royal Mile sits high above on a hill while the New Town rests down below and the two used to be separated by a lake, or loch. The lake was drained and rubble from the excavations and building of the New Town was piled in the lake bed to connect the two parts of town. 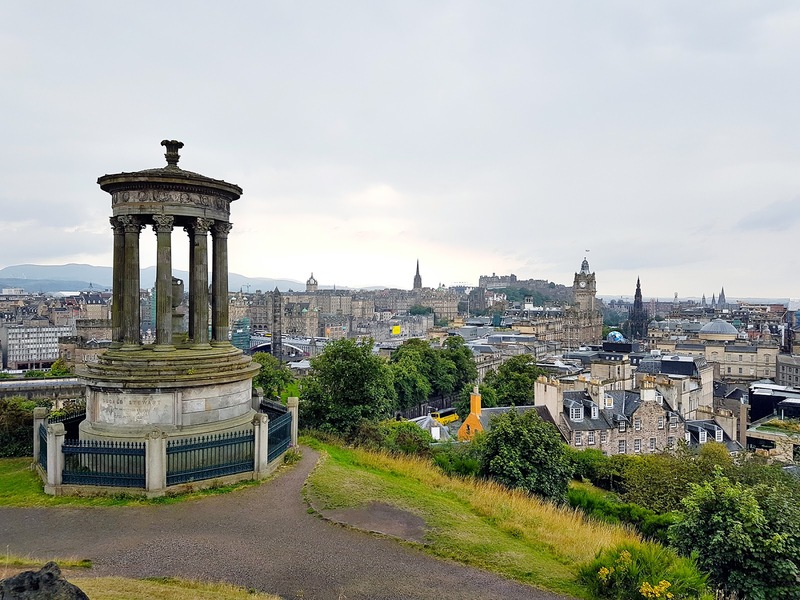 Now some of Edinburgh's most notable buildings such as the National Gallery and the headquarters of the Bank of Scotland call this artificial hill home. 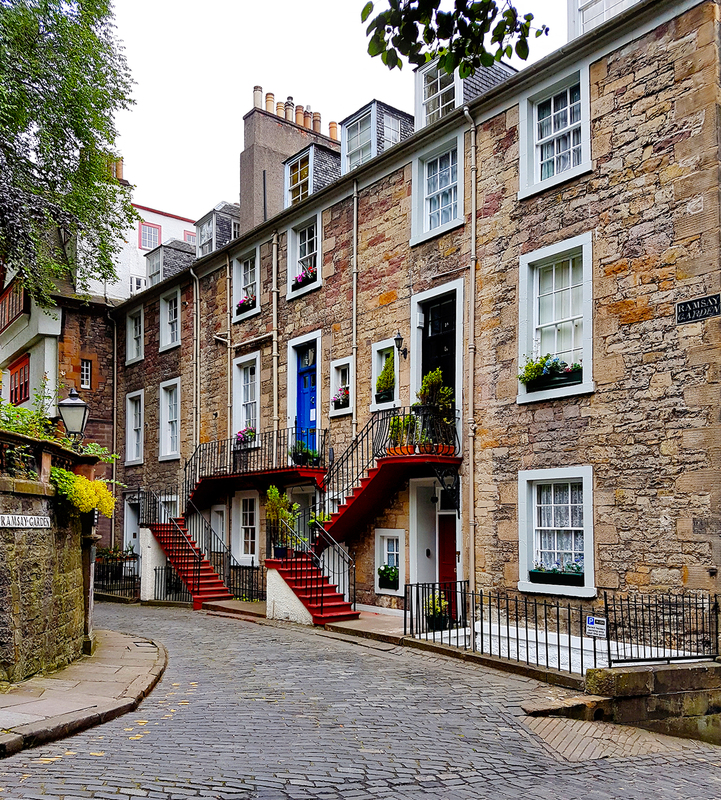 Little charming back corner of Edinburgh. 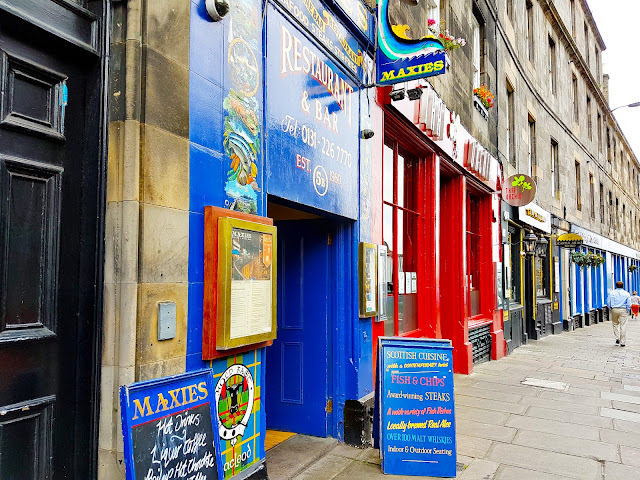 The Royal Mile is one of Europe's most interesting and enjoyable walks. 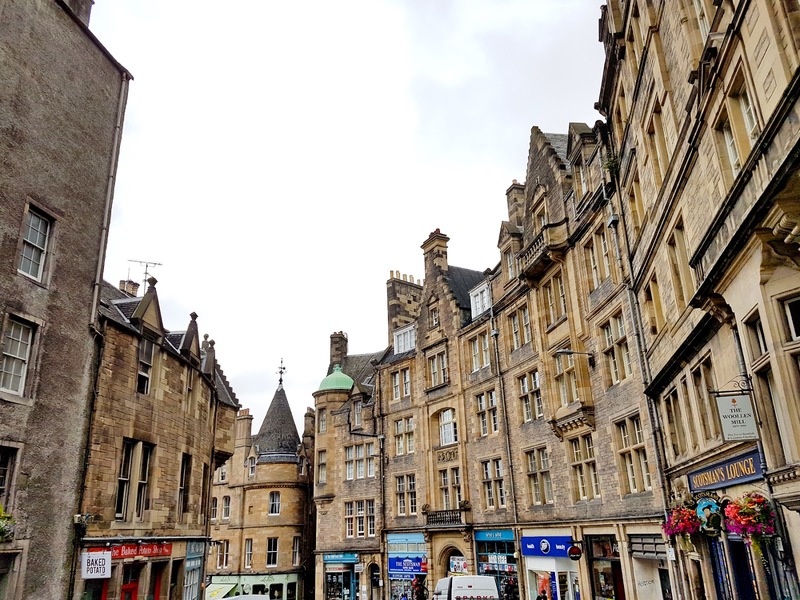 It's actually a couple hundred yards longer than a mile and is a straight stretch consisting of four different streets and every inch is packed with shops, cafes, and historic sights. We started at the top of the mile by the castle and walked downhill towards the end at the Palace of Holyroodhouse. It was cloudy, but we stayed dry until the very end of the mile. 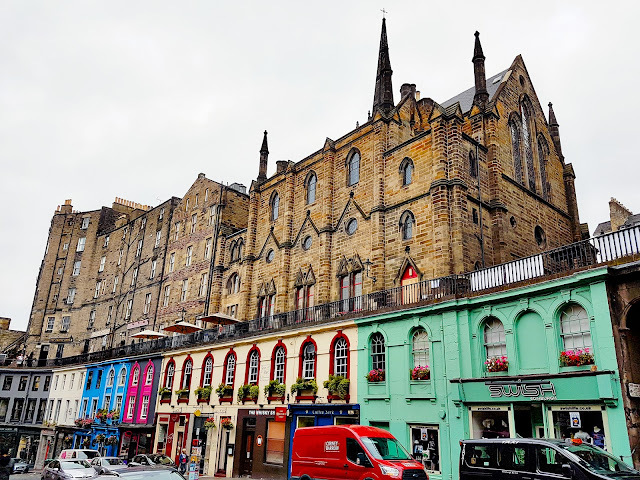 Just down from the castle is a Neo-Gothic church (with the tallest spire in the city) which has been converted to "The Hub," Edinburgh's festival ticket office and information center. Looking through the railing of George IV Bridge down on to Cowgate. 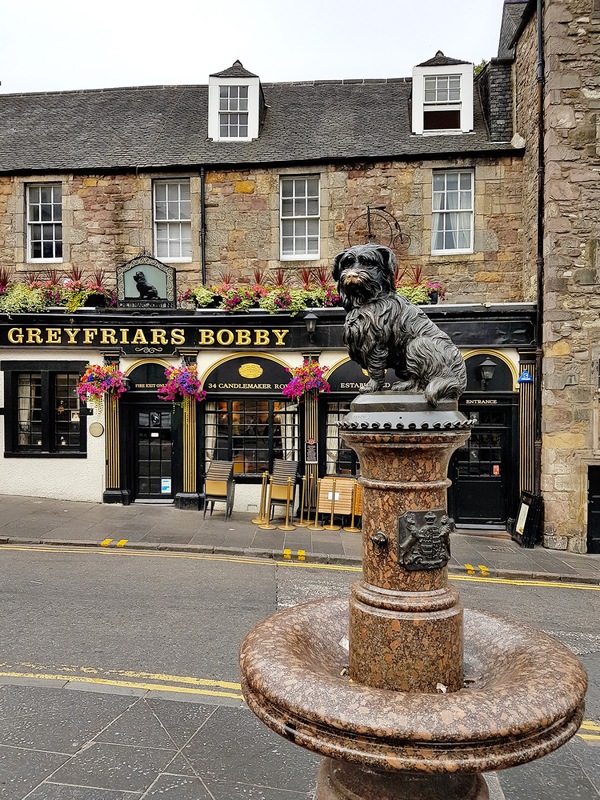 Since we were close, we walked a bit further down and saw the famous statue of Greyfriars Bobby, Scotland's favorite dog. This Victorian-era terrier is reputed to have stood by his master's grave for 14 years. Every nearby business is named for the dog, including this epically cute pub. Greyfriars Bobby and some of the Edinburgh cityscape. 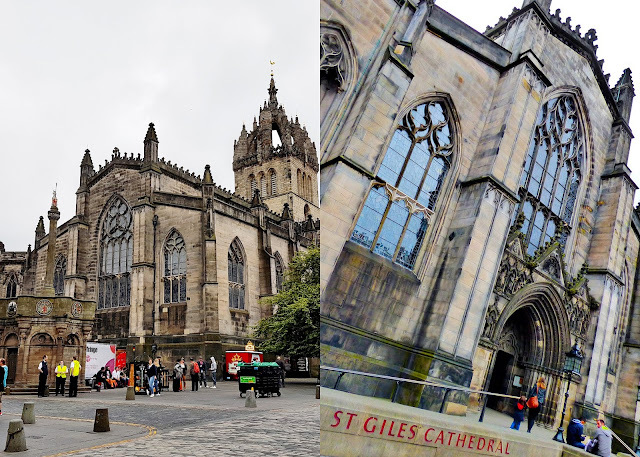 Back on the Mile, we made it to St. Giles' Cathedral. This is Scotland's most important church with an ornate Scottish crown steeple. 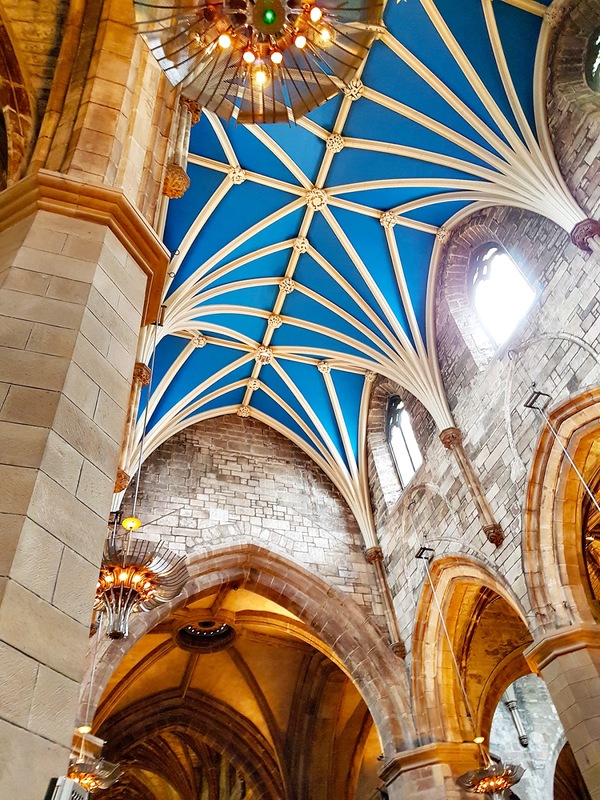 The church is like a Scottish Westminster Abbey celebrating and honoring important figures in Scotland's history. 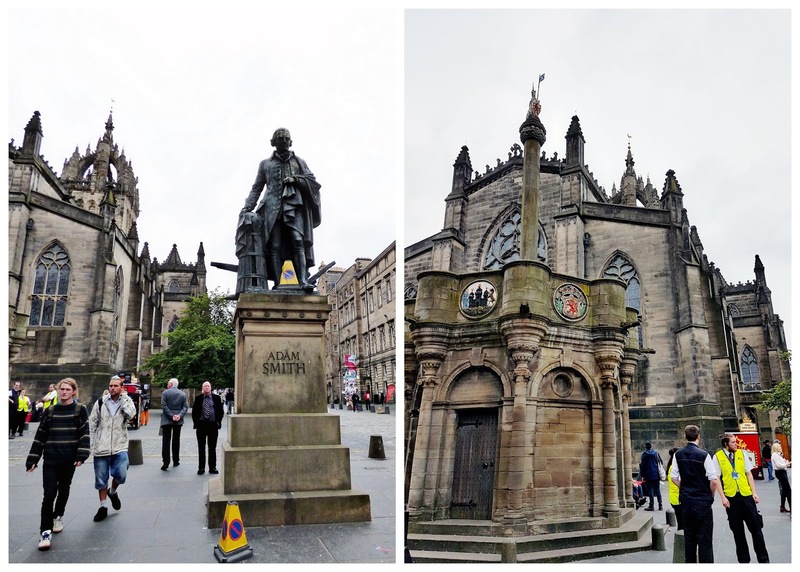 Statue of Scottish economist Adam Smith. 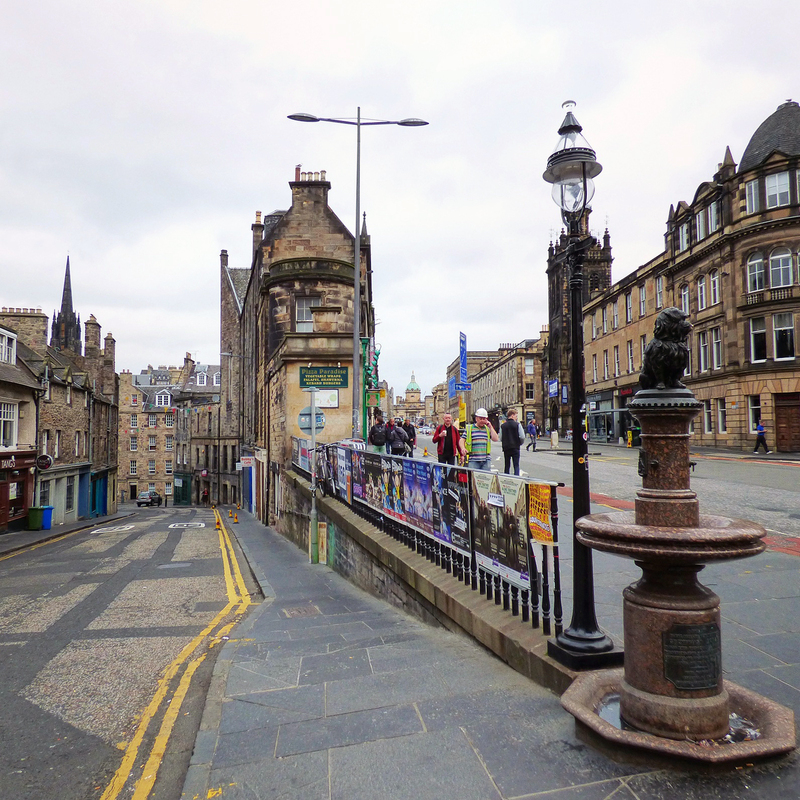 | The Mercat Cross where royal proclamations have been read since the 14th century. 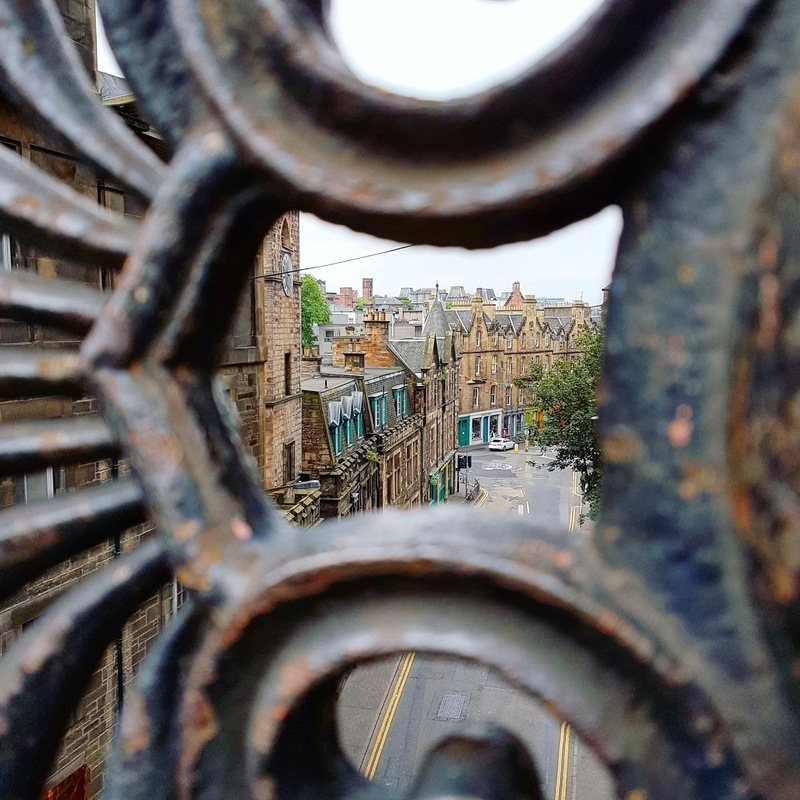 This picture was actually taken on Saturday, but it was in the heart of Edinburgh, so... here it is on today's post! 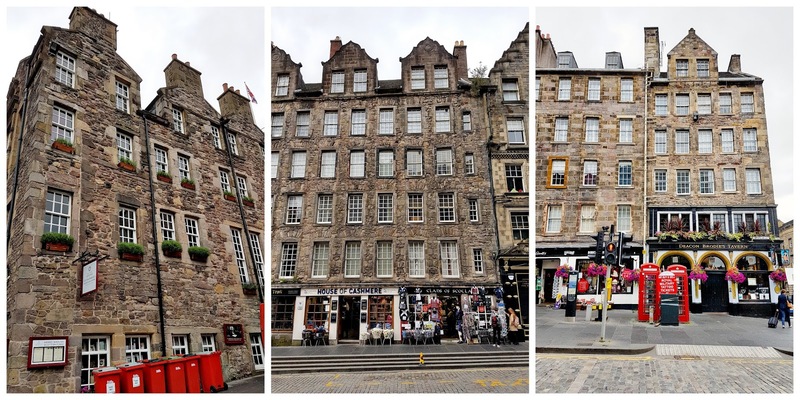 The architecture of the Royal Mile is awesome. 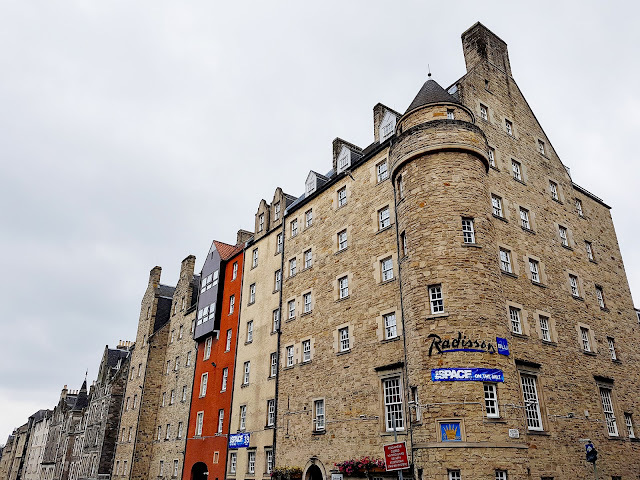 Coolest Radisson Hotel ever? I say yes. 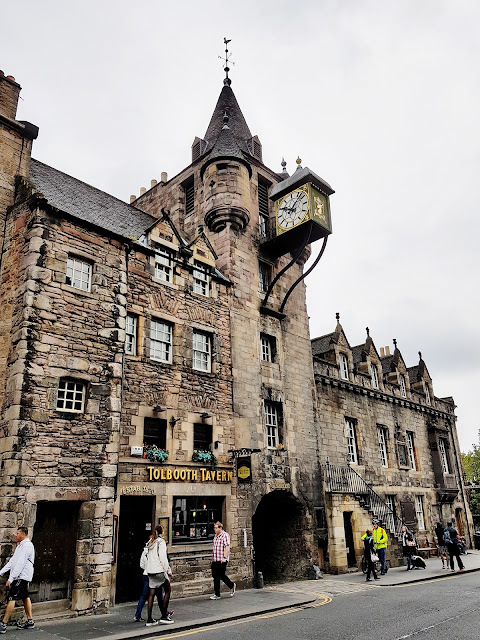 Canongate Tolbooth, not a typo, built in 1591. It was built as a "tolbooth," which is what the Scots called the courthouse or main municipal building in a "burgh", which is what the Scots call a town. Get it? Got it. Good! 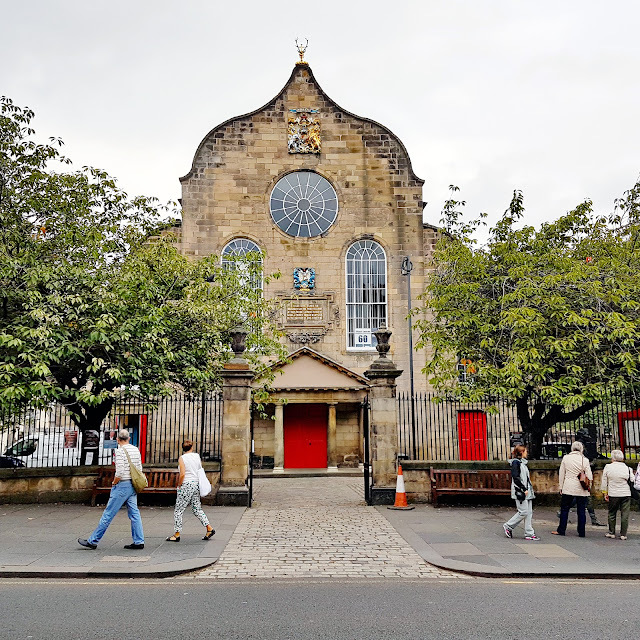 Canongate Church, just down from the Tolbooth, built in 1688. We had now reached the end of the Royal Mile and got some great views of Arthur's Seat, the 822 foot high remains of an extinct volcano. 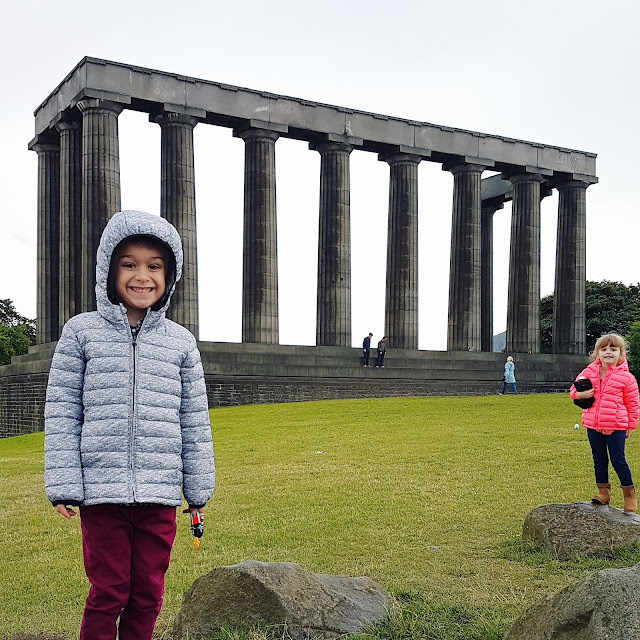 There is a great hike up to the summit of it, but the weather was starting to deteriorate, we had two kids in a stroller, it was lunch time, we had to be somewhere soon... Excuses excuses, I know I know. If only there were more hours in the day! Down at this end of the Mile is the new Scottish Parliament Building. 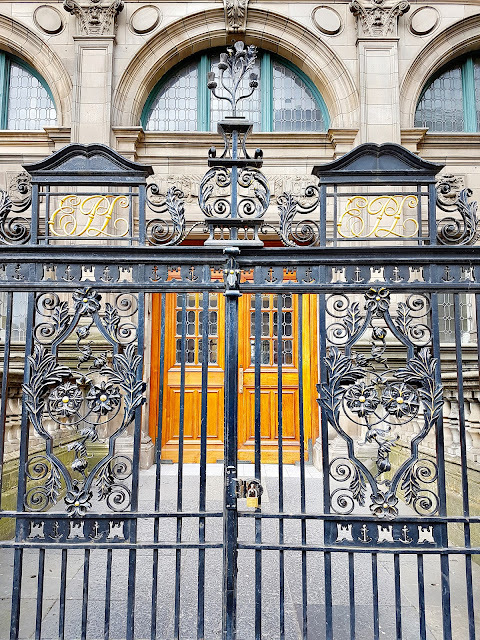 In 1998 it was decided that Scotland could have its own parliament again after almost 300 years without one. The parliament moved into this modern building in 2004. 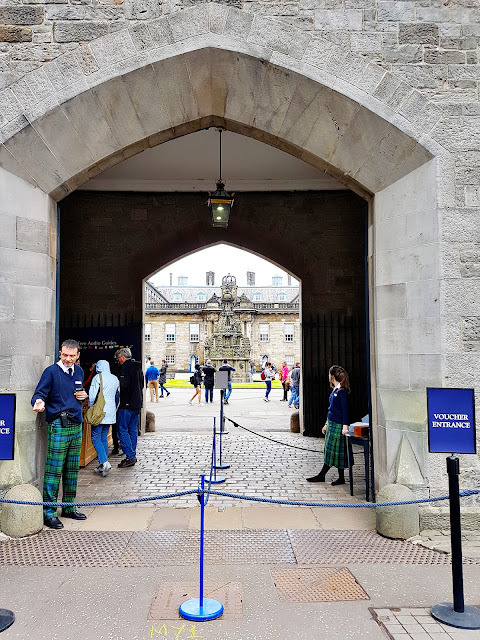 Across from the Scottish Parliament is the Palace of Holyroodhouse. Since the 14th century, this palace has marked the end of the Royal Mile and was the preferred living quarters of Scotland's royalty, rather than the blustery castle up on the rock at the top of the Mile. We didn't go in, but it looks nice! 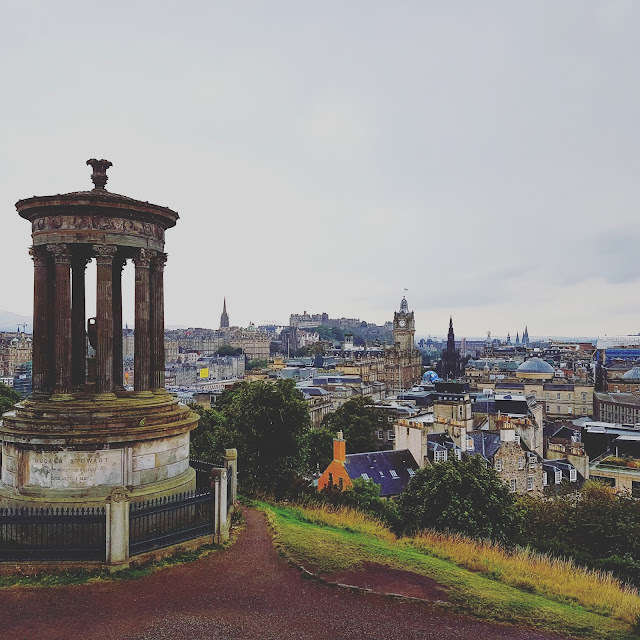 Also atop Calton Hill is the National Monument. It was meant to be a replica of the Parthenon in Athens, but they ran out of money and have left it alone since. It may not be "finished," but we still thought it was cool. 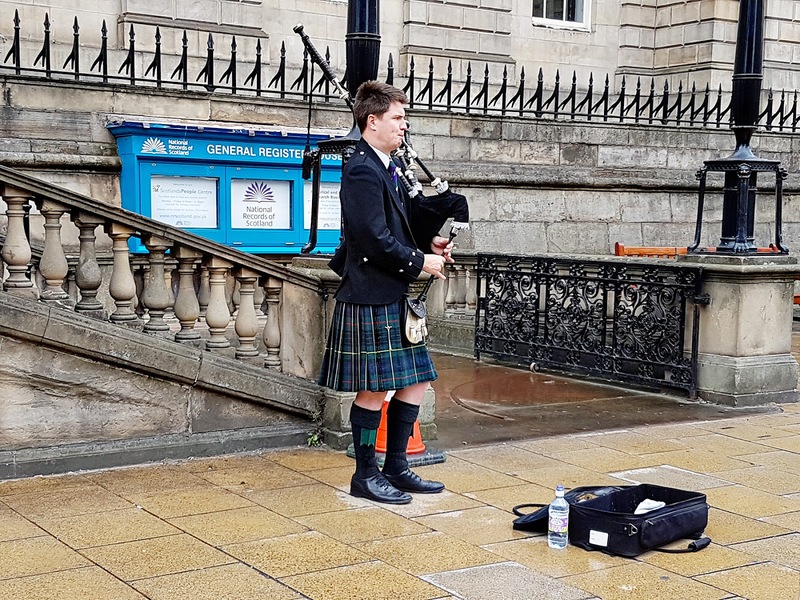 We walked back down the hill to the main drag of New Town, Princes Street, and saw a kilt-clad bagpiper! 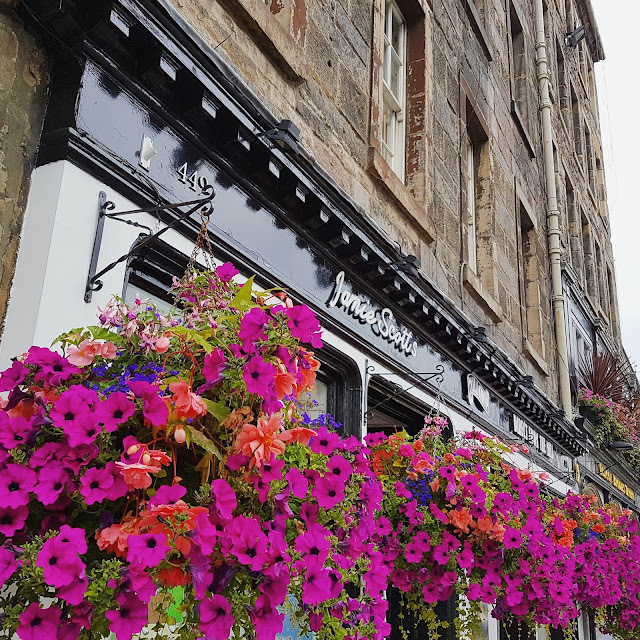 So quintessentially Scottish! Reminds me of Ross from Friends. Of course, this young man is much better than Ross was, no offense Ross. Looking up towards the Mile and St. Giles' Cathedral from Princes Street. Along Princes Street is another of Edinburgh's landmarks: the Sir Walter Scott Monument. 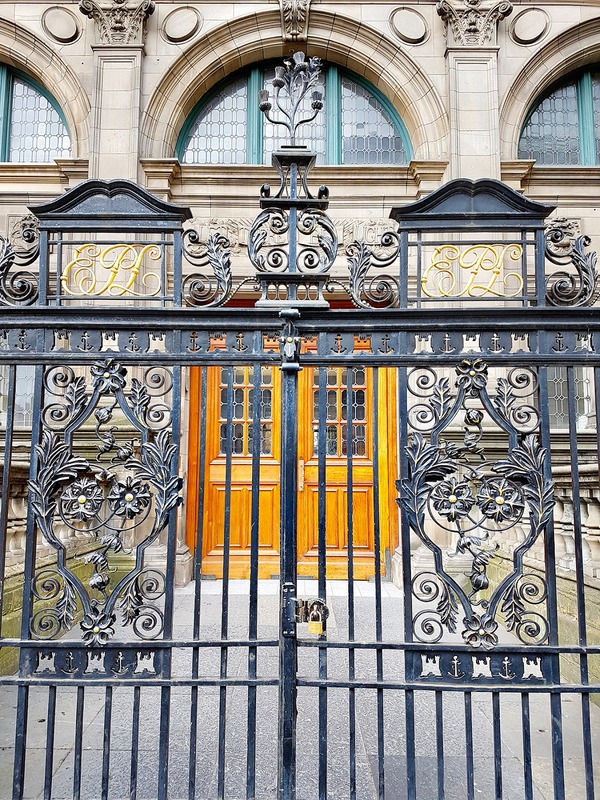 Built in 1840, this elaborate Neo-Gothic monument honors the great author, known as the Father of the Romantic historical novel. The 200-foot monument shelters a marble statue of Scott and his favorite pet, Maida, a deerhound. There is so much in Edinburgh, we barely scratched the surface! 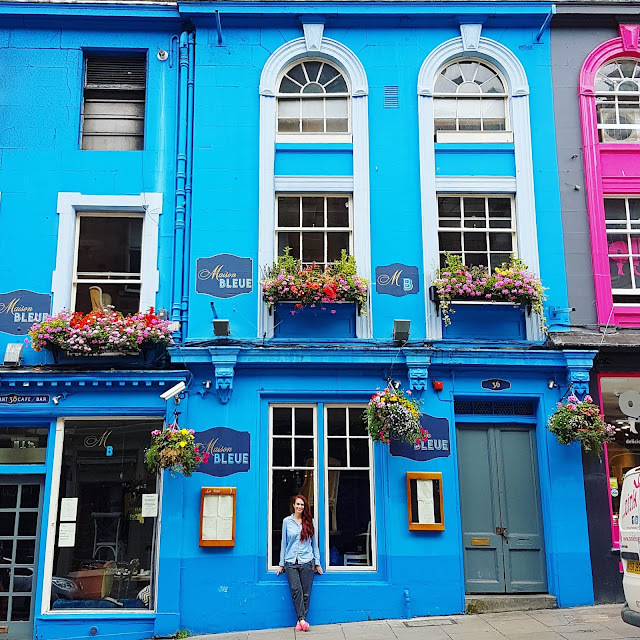 But we loved what we did see and would LOVE to go back sooner rather than later! 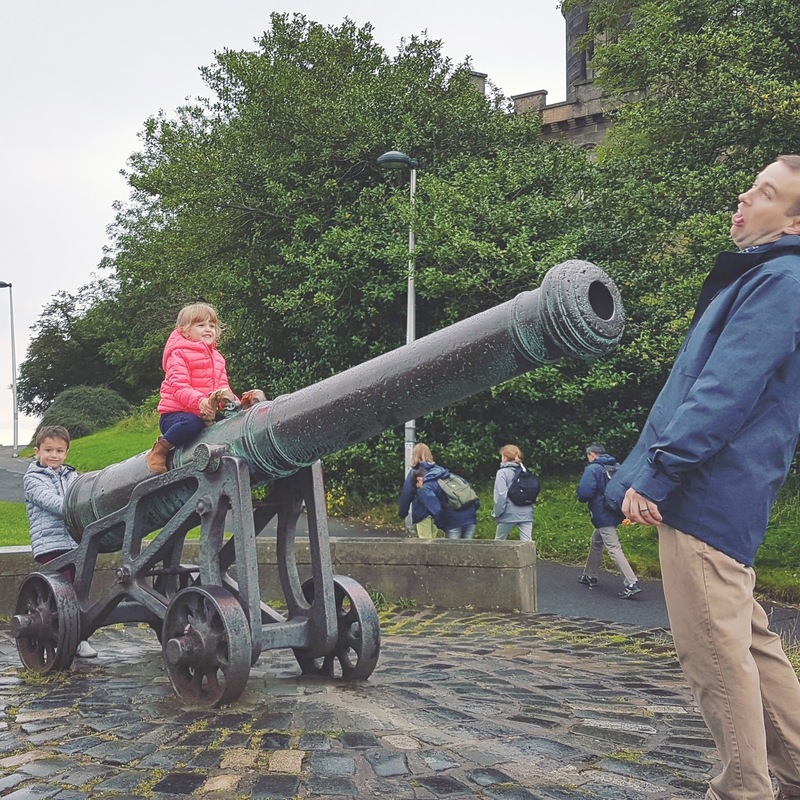 Our family in Edinburgh, Scotland on Friday August 19th 2016. What a fun trip! I went with a few friends for a two-day trip in Edinburgh while I was on study abroad and this brings me right back there :) You made a good call on not hiking Arthur's Seat...I wrote in my journal that it was a painful cobblestone path so I'm betting it wouldn't be great with the stroller! 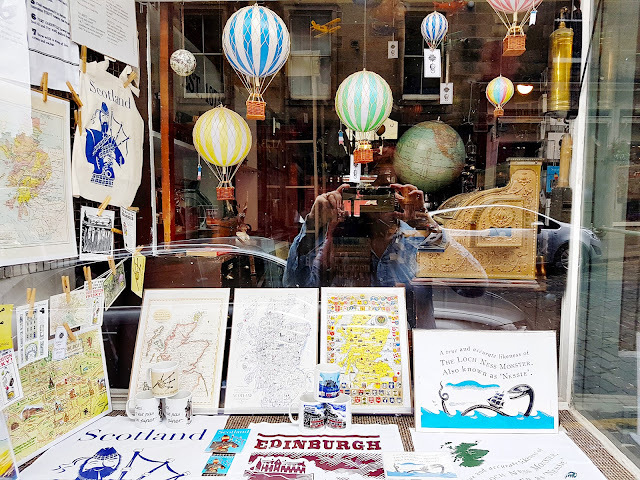 I like your scrappy posts but I LOVE your travel posts - keep 'em coming! 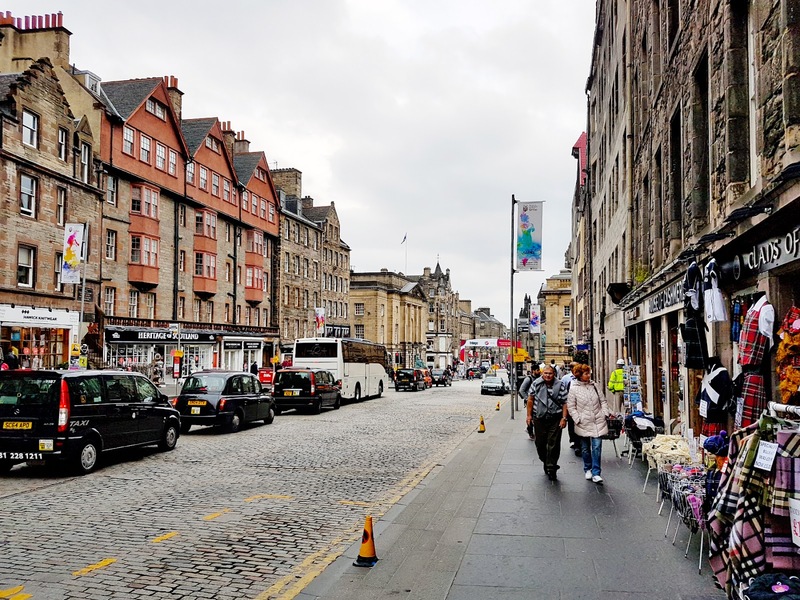 Edinburgh is probably my favourite UK city (my mother came from there), so I was very happy to read about your visit. Very clever matching your shirt to the building colour in Victoria Street - great skills there Paige! 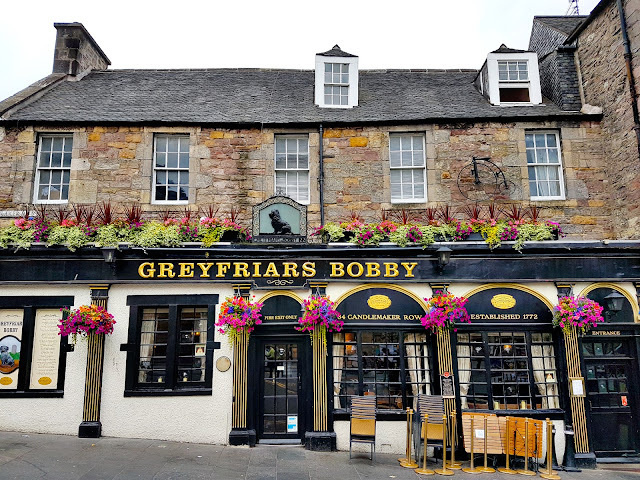 There is a lovely book telling the story of Greyfriar's Bobby, and a picture book for younger children; I hope you find it and can read it to your kiddos. What? No pix of the HPotter tour. I loved all the books, and movies. A trip to Scotland is on my bucket list, so I truly enjoyed your pix. 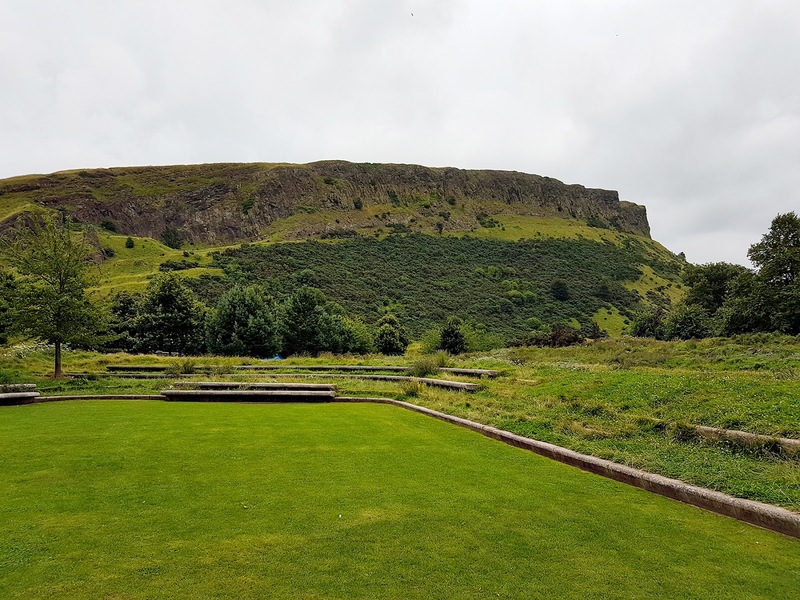 I've seen pix of the view from Arthur's Seat. Its spectacular! So maybe if you go back you'll get to see it. Thanks for sharing your many travels.